Want to improve your handicap or finally get that tricky hole-in-one at the 18th hole? Then you’ll need the help of one of the best golfing rangefinders on the market. This is a handy gadget that will allow you to estimate the distance to certain points on the course in order to make the best shot. There are two types of golfing rangefinder you can get. The first is a GPS system which only works with mapped courses. 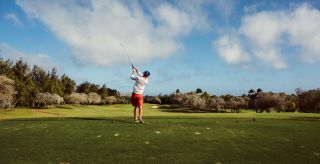 So if you are a member of a golf club and want to introduce a secret weapon into your weekly games, check with your golfing pro to see if the course is mapped. GPS systems tend to come at a lower cost, but as anyone with a satnav will know, they are not always 100% accurate. Laser golf rangefinders, on the other hand, are can provide a higher level of accuracy. You simply aim the rangefinder at the object in question and it will pinpoint the distance for you. If you tend to play away at different clubs or go on golfing holidays, a laser rangefinder doesn’t require a mapped course, so you can use it anywhere. They come at a slightly higher cost, but if you’re serious about your golf then we think they are a worthwhile investment that will last you for years to come. Ultimately these are a great way to improve the speed of play and consider all golf course factors such as slope and elevation (and they will give those poor golf caddies a little rest!). Take a look at our top picks to bag that hole in one! The Bushnell Neo Ion Watch is a handy little device which you can keep on your wrist for easy accessibility when play a game of golf. The best thing about this GPS rangefinder is that it is already preloaded with over 35,000 different courses worldwide and you’ll get free course updates for life when you purchase this gadget. It is lightweight and easy to use with an incredibly long battery life and is also waterproof for those who never miss a game of golf no matter what the weather. We think this is easily the most simple to use and best value golfing rangefinder available. This laser rangefinder is fast becoming a game-changer in the golfing world. For those of you who are looking to purchase your first rangefinder but don’t want to splash the cash on the likes of a Bushnell, then the Precision Pro NX7 is the one for you. It has excellent slope technology, allowing you to accurately measure distances either up or downhill and it is entirely water and shockproof for those who play golf even in the worst conditions. For the price, users cannot fault this rangefinder. If you want to step up your game when it comes to golfing, then the Bushnell Pro X2 will soon become your new best friend. Although pricey, this rangefinder is a great investment for those who play golf frequently on courses worldwide. It has a range of features including JOLT Technology and 6X magnification for the most accurate results. With a range of 1,300 metres, this is by far one of the most comprehensive rangefinder on the market right now. For those who like the look of the Bushnell Pro x2 but don’t want to spend too much money, the TecTecTec VPRO500 has a decent range on it and comes in at a fraction of the cost of the Bushnell. Although the lens quality may not be as good, this rangefinder uses Pinsensor technology for fast and accurate results and it comes with a handy carry case and lanyard. For those golfers who are unsure whether technology will be a help or a hindrance, the Nikon 8397 ACULON is an easy to use rangefinder that has a single button operation making it ideal for all ages and even those who struggle with technology. It Is also incredibly affordable, so if you’re really sitting on the fence about whether to get a rangefinder or not, this is one of the best golfing rangefinders for beginners. Garmin is well-known in the GPS world for its accuracy and the Garmin Approach G10 is no exception. This compact clip on device can give you precise distances to the front, middle and back of the green. You’ll be able to keep track of your score on the score card and you’ll be able to receive free course updates for life when you purchase this gadget. For those who don’t get on with laser rangefinders, this Garmin is the perfect golfing rangefinder for you.